Based on a hypothetical assumption, the project deals with conceptualizing a new product and brand identity for Ashok Leyland trucks for the era 2020. All the groundwork is done considering the Indian present scenario as well as the emerging future. 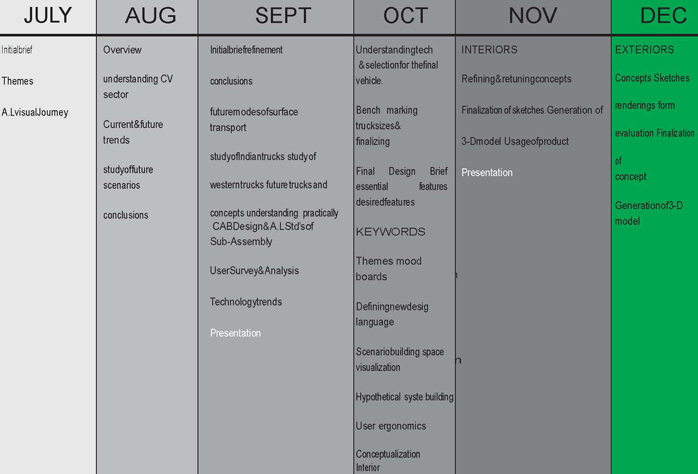 This thesis project offers me a opportunity to understand the actual process of commercial vehicle design in terms visual language, theme, brand identity, surfacing, conceptualization and product modeling. Working Title – Advance concept truck for Ashok Leyland 2020. URBAN FLOW, NEW EXPERIENCE, SIMPLICITY. 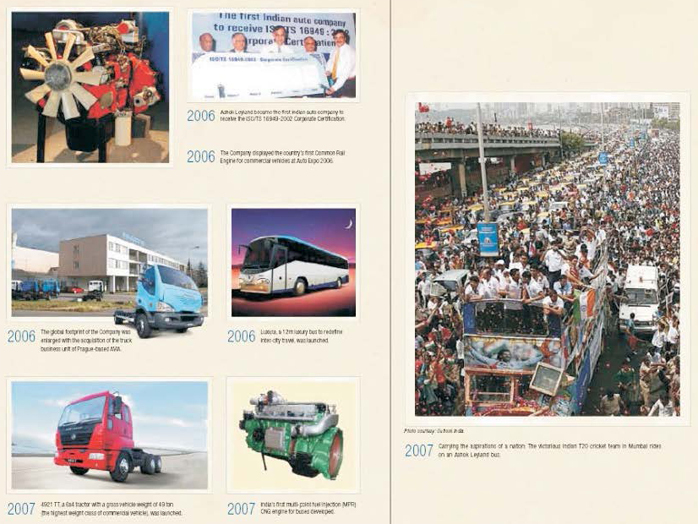 • To Understand Ashok Leyland brand identity and history. To address the identity of Indian trucks to compete with World class level. To celebrate the new design language and identity. - Holistic approach towards the future transportation system which is simple, sustainable, effective and efficient. - The project would be focused on futuristic solutions of predicted change in systems of future transport. For over five decades, Ashok Leyland has been the technology leader in India's commercial vehicle industry, moulding the country's commercial vehicle profile by introducing technologies and product ideas that have gone on to become industry norms. From 18 seater to 82 seater double-decker buses, from 7.5 tonne to 49 tonne in haulage vehicles, from numerous special application vehicles to diesel engines for industrial, marine and genset applications, Ashok Leyland offers a wide range of products. 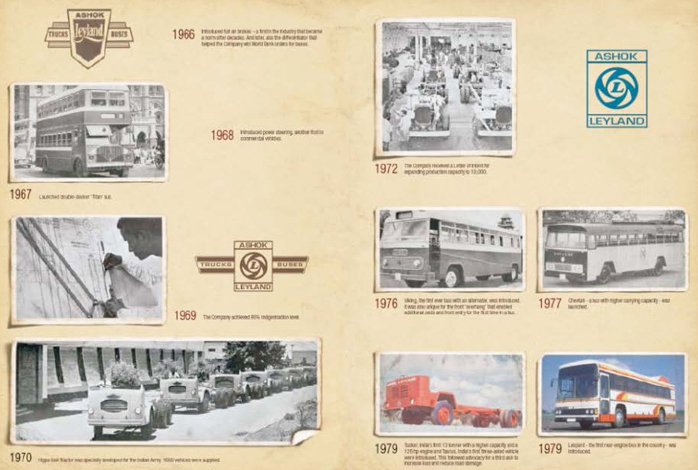 The origin of Ashok Leyland can be traced to the urge for self-reliance, felt by independent India. Pandit Jawaharlal Nehru, India's first Prime Minister persuaded Mr. Raghunandan Saran, an industrialist, to enter automotive manufacture. In 1948, Ashok Motors was set up in what was then Madras, for the assembly of Austin Cars. 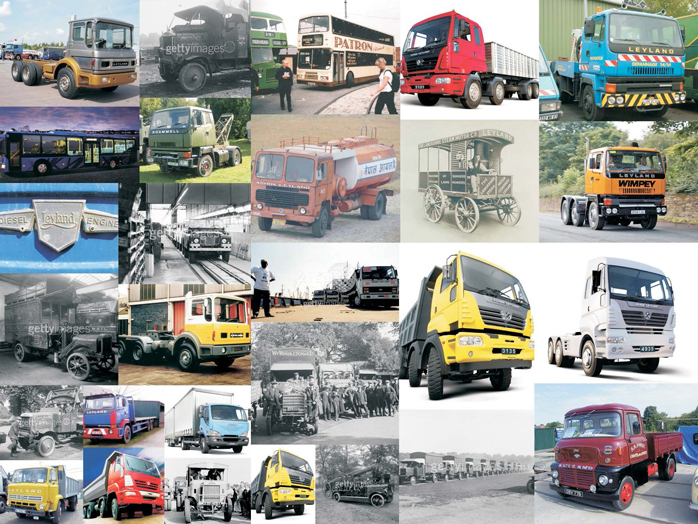 The Company's destiny and name changed soon with equity participation by British Leyland and Ashok Leyland commenced manufacture of commercial vehicles in 1955. 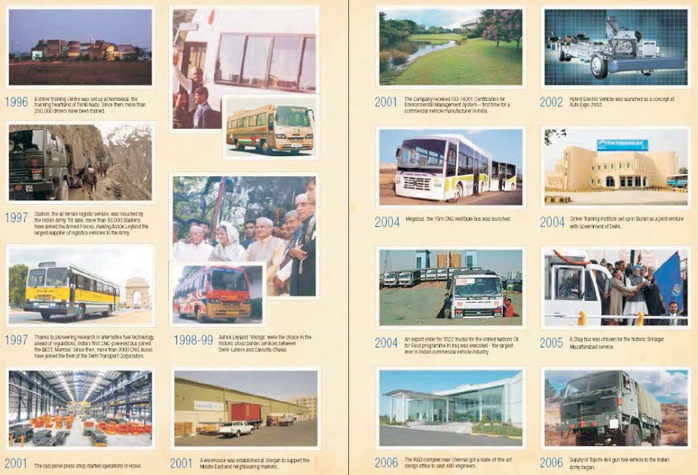 Since then, Ashok Leyland has been a major presence in India's commercial vehicle industry with a tradition of technological leadership, achieved through tie-ups with international technology leaders and through vigorous in-house R&D. Access to international technology enabled the Company to set a tradition to be first with technology. Ashok Leyland vehicles have built a reputation for reliability and ruggedness. The 5,00,000 vehicles we have put on the roads have considerably eased the additional pressure placed on road transportation in independent India. The journey towards global standards of quality, Ashok Leyland reached a major milestone in 1993 when it became the first in India's automobile history to win the ISO 9002 certification. The more comprehensive ISO 9001 certification came in 1994, QS 9000 in 1998 and ISO 14001 certification for all vehicle manufacturing units in 2002.